The International Monetary Fund cut its forecast for the world economy, predicting it will grow at the weakest pace in three years in 2019 and warning fresh trade tensions would spell further trouble. In its second downgrade in three months, the lender blamed softening demand across Europe and recent palpitations in financial markets. It predicts global growth of 3.5 per cent this year, beneath the 3.7 per cent expected in October and the rate in 2018. The outlook is perhaps more upbeat than that of many investors who openly fear a U.S-led slowdown taking hold. The fund left its projections for the U.S. and China unchanged and even anticipates a pickup in worldwide expansion to 3.6 per cent next year. Risks nevertheless “tilt to the downside,” the IMF said in a report which came hours after China revealed the slowest expansion since 2009 last quarter. It will set the tone for this week’s World Economic Forum meeting in Davos, Switzerland. “It is important to take stock of the many rising risks,” said Gita Gopinath, the fund’s new chief economist. Among the threats cited in the report were more trade tariffs, a renewed tightening of financial conditions, a “no deal” Brexit and a deeper-than-anticipated slowdown in China. 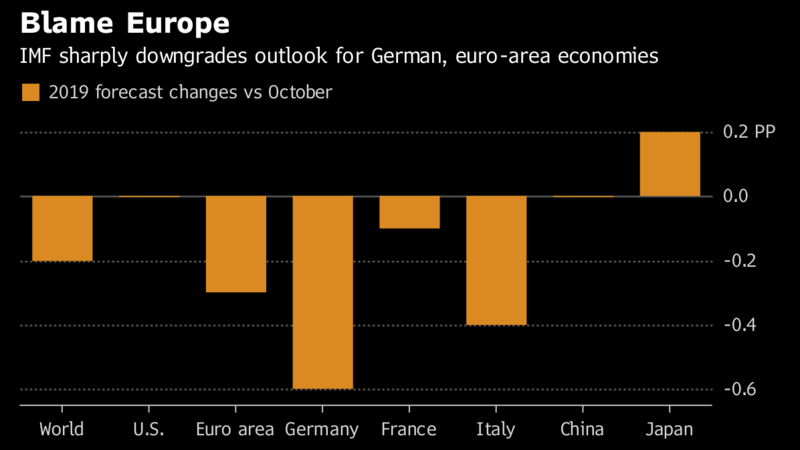 Among major economies, the deepest revision was for Germany, which the IMF now sees expanding 1.3 per cent this year, down 0.6 percentage point from October. Soft consumer demand and weak factory production after the introduction of stricter emission standards for cars was behind the shift. The fund also cut its forecasts for Italy, citing weak demand and higher sovereign borrowing costs, and France, where the so-called Yellow-Vest protests have hurt the economy. The overall euro area will grow 1.6 per cent this year, 0.3 point below what it previously thought. “The possibility of tensions resurfacing in the Spring casts a shadow over global economic prospects,” the IMF said. It predicts global trade volumes will rise 4 per cent this year and next, the same pace as in 2018 but below the 5.3 per cent of 2017. There was a big downgrade to Mexico’s prospects -- by up to half a percentage point -- while the IMF said a slump in Venezuela may be deeper than previously anticipated. The 2019 U.S. forecast was unchanged at 2.5 per cent. But the IMF said growth in the world’s biggest economy will cool to 1.8 per cent in 2020 as stimulus from tax cuts fades and the economy responds to higher Federal Reserve interest rates. As for China, the IMF still expects expansion of 6.2 per cent this year after 6.6 per cent in 2018, a slowing due to the trade war and the government’s attempt to pare leverage.